Flowers as we offer same day delivery at no additional cost. Backed by our commitment to superior quality, Apple Creek Flowers provides custom flower arrangements tailored to you, as well as personalized service from beginning to end. From everyday arrangements, to weddings and corporate events, we provide exceptional floral designs and dedicated customer service. The owners and staff have generations of experience in both design and customer service. You can confidently order our most requested designs online, or call our shop to discuss your specific needs. Our associates are eager to help you design the perfect arrangement for yourself or that special recipient. We can even help you deliver flowers nationwide through our network of trusted florists. Rather than providing cookie-cutter arrangements for our clients, we specialize in creating custom floral designs with their vision in mind. Whether it is a specific ambiance for a wedding, creating themed centerpieces at a corporate fundraiser, or enlivening the office through weekly scheduled deliveries, our flowers stand out with exceptional quality. Enhance the elegance of your wedding day with custom flower arrangements catered to your tastes. 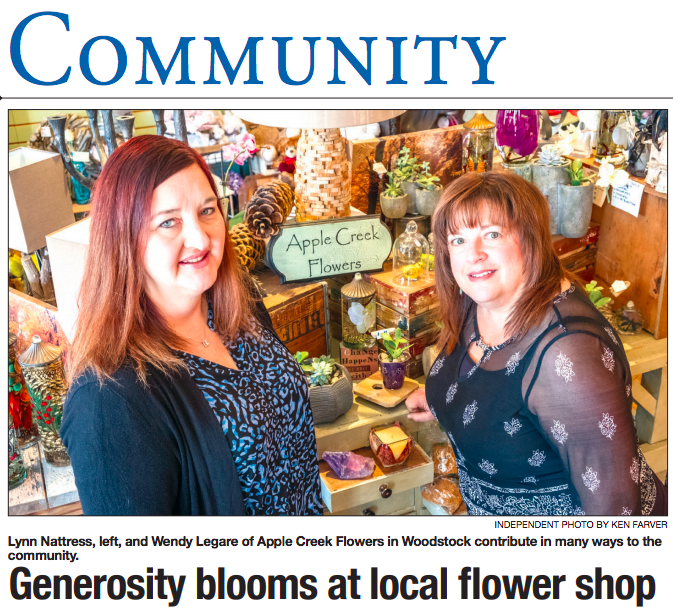 At Apple Creek Flowers, the owners, Lynn Nattress and Wendy Legare, meet with the couples to get to know them, and learn about the vision for their special day. From personal flowers to ceremony and reception décor, Wendy and Lynn can provide many design options, and even rental items, while guiding you to flowers that will help maintain your budget. They personally design and oversee every detail to ensure that the most exquisite floral designs reach your hands on this special occasion. From boutonnières to table centerpieces, we’ll create wedding designs that are as unique as the love that you share — so you can look back on your wedding memories with joy for years to come. Treat your workplace, home or loved ones to a touch of regular beauty with our convenient, personalized subscription service. Having fresh flowers regularly delivered can elevate the entire atmosphere of your space, communicating a sense of respect to colleagues and clients alike. That’s why, at Apple Creek Flowers, we provide subscription services that allow you to enjoy customized blooms regularly delivered to your chosen location within McHenry County, bringing fresh flowers to offices, homes, churches, businesses, and even cemeteries. We can set the schedule to meet your needs and customize the floral arrangements to your tastes, and budget too. Whether we’re making weekly office flower deliveries or creating hundreds of centerpieces for a corporate fundraiser, we always emphasize quality control and operational excellence in our floral projects. Talk to us about enjoying customized arrangements for your luncheon, party, meeting or other corporate event. Whatever your affair, we’ll be glad to make it even more special through personalized floral arrangements catered to your brand. Honoring a loved one that has passed is easy too with monthly cemetery deliveries (upon cemetery approval.) From urns to hanging baskets and even seasonal grave blankets, we can make sure that your loved one’s eternal resting place is one of honor and beauty. Custom printed invitations, napkins, save-the-date cards and more can be found at Apple Creek’s own invitation website: applecreekweddings.carlsoncraft.com. Ordering online is easy, and a big time-saver, and Apple Creek makes it almost error-proof with being able to show you sample colors in person. Colors on monitors are different than those that are printed in ink, so trying to match a color for your occasion can get tricky! Apple Creek takes the guess work out of the color choice by having ink and color samples in their shop. Double checking a color match takes the guess work out of the equation and you can be confident in your online ordering choices. Searching for a special gift to give or to accompany a floral arrangement? Apple Creek Flowers has you covered! The store has an industrial-rustic vibe that makes shopping a treasure hunt, with new items to discover at every turn. From cards and chocolates to candles, jewelry, men’s gifts, green plants, home decor and MUCH more, you are sure to find that perfect something. We pride ourselves on carrying as many items as we can that are made in the USA, and that are giveback programs, such as proceeds to Veterans, food to children, and resources back to the environment. Our associates are happy to help you find something whether you are in the shop or on the phone. We can also help you shop direct with our applecreekgifts.com website. Support your local store and shop from anywhere with the items being shipped to the destination of your choosing. With over 4,000 exquisite offerings, you are sure to find the perfect gift.